I’ve been dumping the full-res (such as they are…) videos that I make (for instagram) to a playlist on YouTube here. They’re all short (duh) and are aimed at telling (very) short stories from my day-to-day functions. They are not, in and of themselves, products, really. I suppose they mostly just serve as a sort of ongoing drill to help me improve. Or something. Shoot the video in FilmicPro. I leave it wedged in 720p/60 frames per second with an automatic output of 30 frames per second. This also drops audio, which I am totally ok with. Load the clips into iMovie and edit. Add the title text (or a splash screen…) and import a soundtrack. Export the whole mess back to the photo roll at full resolution. Grab the edit in Chromic and color grade. I know there are filters in Instagram and iMovie but I like these better- and they offer a bit more control, I think. Push it back to the photo roll. Bring the now edited and graded clip into Instagram. Make sure you pick a decent splash screen. Double color grade if you’re feeling frisky. Tag that thing, too. Done. Some of the new Sony cameras have a neat wifi based proxy recording function where you can send your footage straight to your phone- my Nikon won’t do that (hrmph!) so iPhone it is. It’d be pretty neat to be able to shoot on the serious camera and still edit/grade/upload on the go. Maybe I need to buy a Sony? Some of you may have notices some minor changes around here. Wait- that’s not true. Nobody visits here. Anyway. I’ve added a quick feed to my instagram account on the right side- it shows the five most recent photos I’ve taken. Sadly, it presents videos that I post there as stills (with no indication whatsoever they might be videos…). Whatever. Though instagram is where I’ve been (weirdly) posting most of my new-ish video content. Just this morning started looking at the Storehouse app for putting together narratives in video and still with text. I dunno. Looks promising. It is a terrible mailing list. You’d be a complete and utter fool to sign up. Nothing good will come of it. Resist the urge. Subscribing to Sean Bonner’s or Warren Ellis’ mailing lists would be far better. Mine is rubbish. Despite this stern warning, some folks have started signing up regardless. Fools. That means, however, I will have to begin actually mailing things out. So that’s it. Nothing else new (in terms of design and whatnot. Always lots going on in the background). Alright. This video was shot with a point and shoot. A $600 all-in-one consumer grade camera. A further example of how constraining your tools leads to creativity for solving problems. So. There’s no excuses. There’s no more waiting. Pick up whatever’s in your hands and make the thing already. You don’t need anything else. You don’t need better. We’ve covered how we made the board, and the manipulatives (and tools) we used to build out the game thus far- but we haven’t talked about the variables we’ve constructed to keep each round of the game from being repetitive. I knew we’d need at least three categories, and so with that in mind, I had the two girls sit down with notebooks to brainstorm characters we could create. They drew drafts of monsters, and once we had a meaningfully sized pile, they sorted them into “Good Guys” and “Bad Guys.” I busted out the box of blank cards (mentioned in Part 2), and they made two copies of each monster onto the cards- leaving an area below the monster clear for me to write in attributes. I also made some “Good” cards that facilitate commerce. These are Wizards and Witches, and what they want is to trade you magic in exchange for coins or jewels. Different characters have different exchange rates (all of which float via dice roll…) so sometimes you get a really good deal (and sometimes things are expensive). The girls added some good characters too- more on that below. 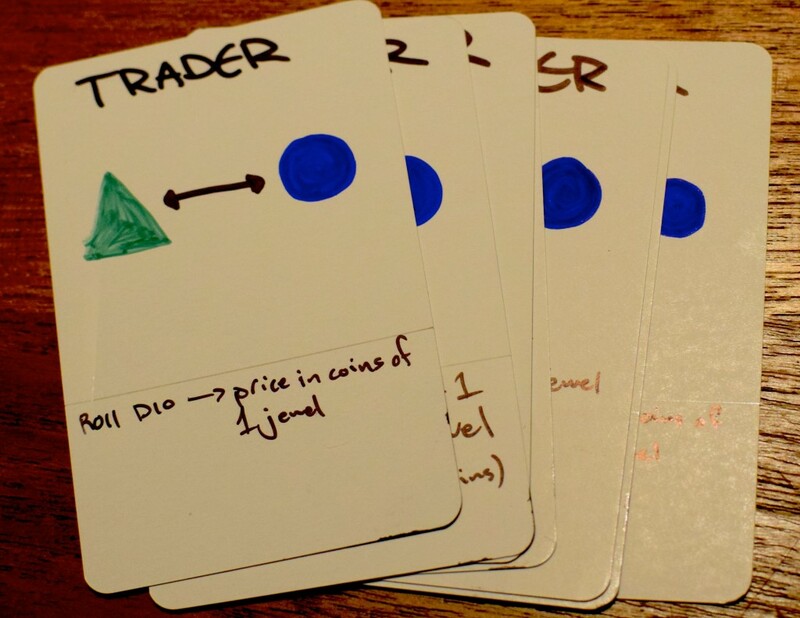 We needed a way to move currency between coins and jewels, so I made a quick stack of “Trader” cards- these characters only move currency between jewels and coins- though I’ve just made some Blacksmith cards (to buys swords from- again, on floating rates), and I’ll be adding a bunch more here as we go on. This category seems to be a good place to introduce new variables. 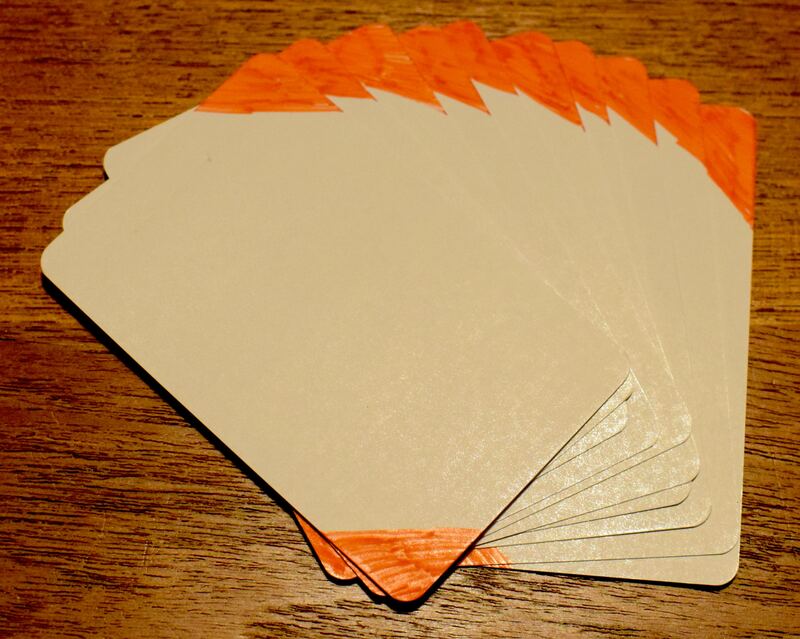 To keep these three (ever-growing) stacks of cards organized, I color coded the backs. Simple. And expandable, because I’m sure we’ll be adding more types of encounters. For storage, each stack gets a binder clip and is put in the same case as all the other gear. I’ve been really impressed with the creativity the kids have shown- we’ve got cards that add points to your dice roll to move around, cards that make you invisible to a bad guy, and (my current favorite) robot cards you can program to do your bidding in your absence. Those are pretty cool. 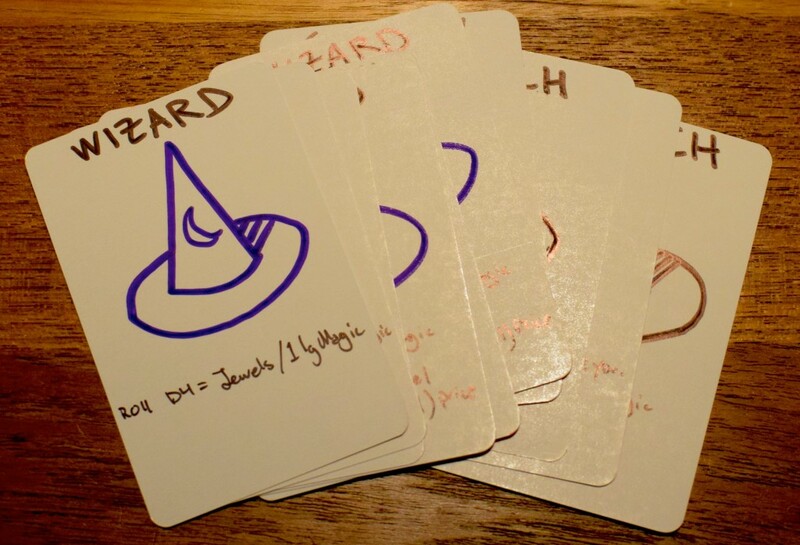 There are all manner of bad guys, and I try to write in a single “Boss” or “Big Bad” per round- it’s not on a card, and it’s attributes can (and do) change. This character is usually the last bad guy on a round, and it’s usually guarding a stash of loot- which you’ll likely need, as you’ll be hurting after fighting it. I also try to plan games so there’s a “healer” shortly after this character, as I don’t want them headed into the next game deep in a hole. Each “round” of the game takes between 30 and 45 minutes right now- and that’s the sweet spot for the girls in terms of attention and enjoyment. I’m ok with that length right now, but I’m hoping to grow that a bit as they become more and more invested. All these notes at the end should have made it clear that there’s very likely to be a Part 4 to this series. That’s not a bad thing.